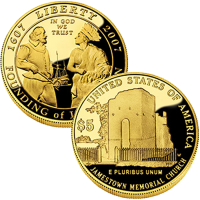 The 2007-W $5 Jamestown Commemorative Proof Gold Coin is one of four coins issued by the US Mint in 2007 to celebrate the 400th anniversary of the founding of Jamestown. Coming aboard three ships, the Susan Constant, Godspeed and Discovery, 105 settlers landed and would establish what would become the first permanent settlement of Europeans in territory that would one day become the United States. Surcharges added to the sale of each coin were forwarded to the Jamestown-Yorktown Foundation of the Commonwealth of Virginia, the Secretary of the Interior and the Association for Preservation of Virginia Antiquities. Funds were to be used to promote and support the 400th anniversary celebrations of the founding. The modern commemorative era of coins from the US Mint started in 1982. Since then, over $400 million has been raised through surcharges added to the sale of the commemoratives. Those funds were then forwarded to organizations dictated by the legislation which authorized each coin. Each Jamestown Gold Coin is struck from 90% gold to the diameter of 0.850 inches. 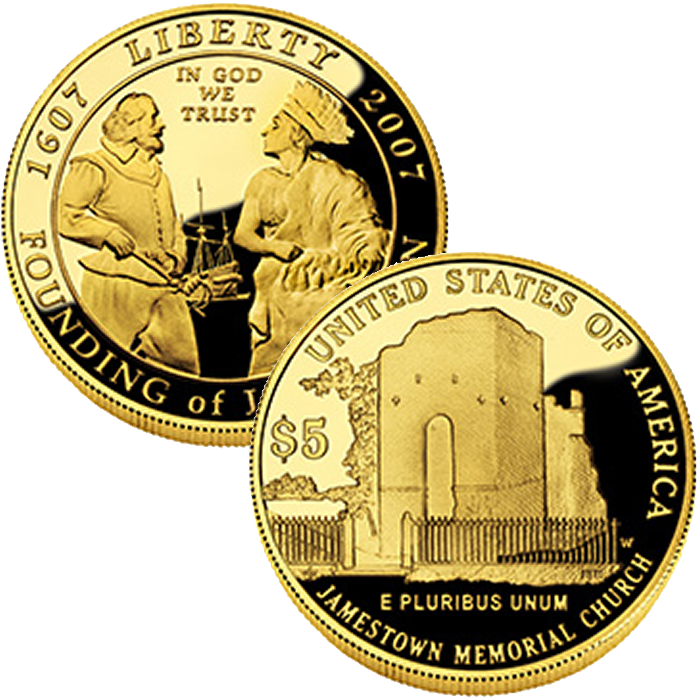 The US Mint released the Jamestown Gold Coin on January 7, 2007. Initial price on the Proof Jamestown Coin was $255.00. A ‘W’ mintmark on each gold coin indicates it was struck at the US Mint’s facility in West Point. Designed by United States Mint Sculptor-Engraver John Mercanti, the obverse (heads side) shows Jamestown settler Captain John Smith with the Native American chief Powhatan. The reverse (tails side) shows the remains of the Jamestown Memorial Church, the only structure which has survived to this day from the settlement. It was designed by United States Mint Artistic Infusion Program (AIP) Master Designer Susan Gamble and sculpted by United States Mint Sculptor-Engraver Don Everhart.